The Lithium Iron Phosphate battery is the ultimate in weight versus power technology. This battery weighs in at only 1.83 pounds and offers an incredible 210 C.C.A. This is a drop in replacement for your Lead-acid battery, and will require no change to your stock charging system. When it comes to Powersports applications and lithium batteries, BatteryStuff.com recommends that you use the best, most powerful version that will properly fit your application. Shorai may list several battery sizes in their application chart that will fit your bike, but in our opinion the small gains in weight are typically offset by she superior starting power offered in the upgraded versions. Should you not require the most powerful version, see the LFX12A1-BS12 for the less potent lithium alternative for this battery. It will be the exact same dimensions and terminal location as our recommended battery, but with a bit less capacity. Lead acid batteries have long been a target with riders who want to take weight off of their motorcycle. With our Lithium Iron Phosphate batteries, it is now possible to do away with the heavier lead acid battery, while maintaining reliable starting power. These are true drop in replacement batteries that will require no charging system modifications, and only weigh a fraction of the OEM battery. We recommend using these batteries in temperatures above 0 degrees Celsius. This battery may require spacers to make it work in your application. Included with this battery are foam spacers that will aid in fitting this battery. ** PbEq equals Lead-Acid Equivalent. This means that a 14 AH PbEq Lithium Iron Phosphate battery will perform the same as a 14 amp hour Lead-acid battery. Rated 4.83/5 Stars from 6 customer reviews. Do you own the LFX14A1-BS12? Please, tell us what you think about it. It helps us provide you with better products. Please note that it may take up to 72 hours for your review to appear. Pros: Super light, great fit. The kit that comes with it is great, but didn't use it due to my configuration. Cons: Could have gone with the larger size. Pros: After 1 year in my 1900cc Yamaha Roadliner, this battery works like a champ. This amazingly lightweight battery cranks my big ole v-twin motorcycle much better than the OEM lead acid battery ever did. Cold weather, hot weather, it doesn't matter. Even when I parked my bike for 2 months without the trickle charger, it fired up like new. Cons: I am concerned that this battery won't give me any warning signs when it's about to die. The nature of a lithium ion battery is to put out 100% up until the moment it goes to 0%. I hope this battery gives me a heads-up that it needs to be replaced somehow. In extreme cold weather, this battery goes into a sleep state and needs to be "woken up". You crank your bike and it sounds like the battery is almost dead. This wakes up the battery. Wait a few seconds and crank your bike and it starts right up. This is the opposite behavior of a conventional lead acid battery. weird, but kinda cool too. Pros: I couldn't count the times I have walked away from mr Suzuki Burgman 400 and left the key and lights on for 15 to 30 minutes. The engine stops when I put the stand down and I just simply forget to turn off the key. This leaves 2 55 watt headlights burning along with double tail and all the running lights. I've had it 6 months and the Shorai battery if fantastic. Cons: Too light to drive tent pegs. I just ordered another Shorai battery for my 1992 Harley. Seems I have to replace the lead acid battery every 2 years and even then if it has been sitting a while it needs a charger hooked up for a bit to get it running. This will be the real test of a Shorai battery. Pros: The weight and size are terrific. I plan to relocate it from my normal heavy battery box on XR650L to under the seat, but haven't done it yet. It's certainly small enough to do it. I had trouble starting my bike recently with the new battery because I had a fuel issue and I cranked it a LOT and it just kept cranking. I expect it outperformed my lead-acid battery by a lot. It's been maintenance free. I've only had it for this spring so far, but it's never needed a charge and cranks perfectly whenever needed, even after dumping the bike in deep sand in Moab half a dozen times and flooding the engine. Cons: It could be in a smaller casing. I personally just want it to be so small I can mount it anywhere. 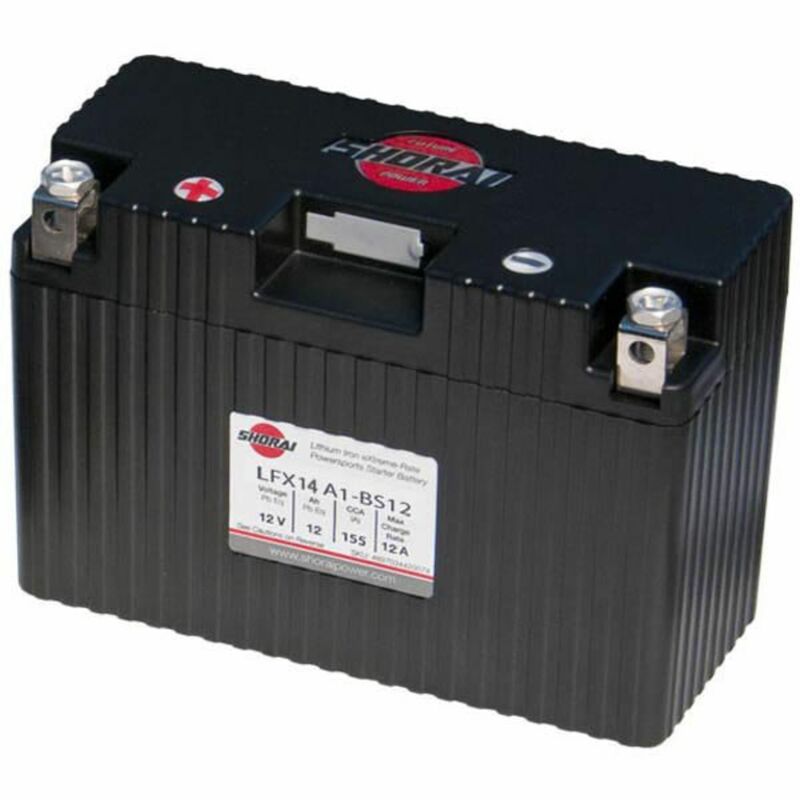 There are other Lithium Iron Sulfate batteries on the market with comparable amps that are in smaller cases. I may switch when I relocate the battery and eliminate the extra 10 lbs of batter mounting hardware on the bike. It's about time our modern sciences that can put a man on the moon and robots on Mars and outside our solar system finally has a battery technology that looks and feels and acts like a lead-acid battery at 1/3 the weight and without polluting our environment. The 100 year old lead-acid technology should have been superceded in commercial applications decades ago. Battery technology is the slowest moving sector of science and technology in the world I expect. Pros: Bought this to replace my scorpian battery in my old 87 honda 250 4 trax. I use the honda around the property and for plowing snow ( electric winch plow lift ).Sometimes it sits for weeks and batteries don't seem to last.This one was a little pricey but I am very surprised on how well it's been doing. It is a light as a feather and was smaller in size but it came with foam shims to make a tight fit and also with new screws/lead for the battery connections. It was worth the extra money-no complaints.